Fall Wine Sale Ends Today! Don’t miss your last chance to save up to 74% on award-winning, handcrafted California wines from The California Wine Club. Plus, every case ships for just $1! It’s the perfect time to stock up for the holidays. When I first met Syrah, it came with a lovable legend about a history that went back to the Crusades: The French warrior Gaspard de Sterimberg, sick of battle, came home to the hills of the Northern Rhône with grapevine cuttings from Shiraz in Persia in his saddlebags. The vines produced luscious black grapes that made a wondrous wine, and he called it "Hermitage" after his home where he would live in peace and study war no more. Nice story. But a few years later, when I had a chance to stand atop the Hermitage hill overlooking a great bend in the Rhône, standing just below Sterimberg's ancient stone chapel, a wine maker told me a different story: Syrah, he said, has grown on the Rhône's hillsides and valleys since the Romans first planted them in Caesar's time. Either way, 1,000 years ago or 2,000 years ago, we can all agree that Syrah has been around for a mighty long time, long enough that the region's wine makers have pretty much gotten it right. Syrah has become popular in most world regions: As Shiraz, it's the mainstay grape among Australian reds. It's popular in California, and just about any wine-growing region with a sufficiently warm growing season has given it a try. It's often grown as a single-varietal wine, varying in style depending on climate from lean and green and laced with fragrant black pepper to a bigger, riper approach focused on black plums and blueberries and even prunes. Ripen it to high alcohol levels and load it up with oak, as the Australians and Californians often do, and you'll get a blockbuster of a wine. Or blend it - Grenache and Mourvèdre are the usual blending suspects, with Carignan and others sometimes added - and you'll add a little complexity for a food-friendly wine that may reach its most popular expression in the warmer Southern reaches of the Rhône. 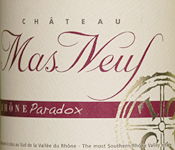 Today's featured wine, the good-value Chateau Mas Neuf 2009 "Paradox" Rhône, is a fine example of the "GSM" (Grenache-Syrah-Mourvèdre style - with Carignan) from Costières de Nîmes, near the Mediterranean at the southern end of the Rhône. You'll find my tasting report below. We're featuring Syrah and Syrah blends as our Wine Focus topic for October the WineLovers' Discussion Group. You're invited to bring your tasting notes, comments, questions, and thoughts about everything Syrah or Shiraz-related, from tasting to viticulture to food-and-wine pairing and wine travel. Don’t miss your last chance to save up to 74% on award-winning, handcrafted California wines. Plus, every case ships for just $1! It’s the perfect time to stock up for the holidays. Choose from 200+ limited-production California wines. Every wine has been hand-selected by club proprietors Bruce and Pam Boring, each one from a small family winery and backed by their 100% satisfaction guarantee. Fall Wine Sale ends at midnight (US Pacific time) today, Friday, Oct. 5, 2012. Prices listed online are per bottle. Sale cannot be combined with any other promotion or discount and/or previously placed orders. Some restrictions apply. Must be 21+ to order. FOOD MATCH: The traditional match is beef or lamb, and a steak or roast would serve this wine well. In the quest for diversity I crafted a more offbeat plant-based dish with flavors meant for a dry red wine, and found success in an East Asian dish of tofu and black beans in a sweet-tart Cantonese sauce. WHEN TO DRINK: This is certainly fine now with food, but there's no need to be in a big hurry to drink it, and another year or two in the cellar might see the tannins evolve and soften a bit, with plenty of fruit and good balance to carry it through until 2015 or longer. VALUE: This wine is a very good value at this price, and with its potential for at least short-term cellaring, worth picking up a few to keep in a cool place on their sides for enjoyment over the next few years. Château Mas Neuf's Website is available only in French, but even if your command of French is limited to wine, food and travel terms, it's worth a click to skim detailed information about the property, its history and its wines. Look for vendors and compare prices for Mas Neuf "Paradox" on Wine-Searcher.com. We're sorry if you must leave us, though. how we could have better served you. Email Robin Garr at wine@wineloverspage.com.